Imagine giving your mother a gift that is born of the emotions in your own heart and hand-created simply for her, to share not only the love you feel, but the many ways in which she has touched and shaped your life. 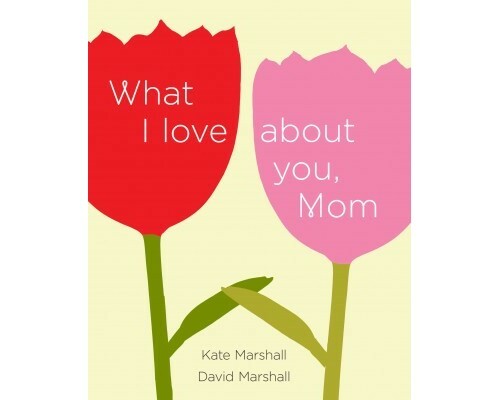 You may think you’re not creative enough to come up with such a treasure, but the new book What I Love About You, Mom by David and Kate Marshall makes giving a personalized gift easy and enjoyable. The amazing this is that you — the giver — will likely enjoy creating this gift as much as the mom you love enjoys receiving it! I hope you enjoy my recent conversations with the Marshalls and that you’ll check out What I Love About You, Mom today! Q: Please briefly introduce yourselves and your family to our readers. David and I have been married for nearly 30 years. In addition to raising two wonderful children – now ages 26 and 23 – together, we co-write guided, fill-in-the-blank journals that celebrate family, relationships, and personal growth. Our goal is to help people communicate in enjoyable, informative, and often profound ways with their loved ones. We’re grateful that over 760,000 copies of our journals have found homes. Our brand new journal – What I Love About You, Mom – has just been published as a gift of love to fill out for mothers. Q: Tell us a bit about What I Love About You, Mom – what prompted you to write the book and what went into its design and contents? As the co-author, I like everything, but David and I worked hard to include a mix of topics and activities so that everyone—all kinds of personalities and preferences—will find things that engage them and are comfortable to them. I also liked writing about things I look forward to in our relationship; things I want her to a part of in my life and that I hope we can do together, both big (celebrating future weddings and grandchildren) and small (tea time, watching our favorite shows, going on walks). My Life Map: A Journal to Help Shape Your Future helps people at any stage of life create a road map of both their past and their future in all major life areas. It encourages you to set goals and shape a future with intention and purpose. Picture of Me: Who I Am in 221 Questions offers an engaging way to answer life’s most basic questions: “Who am I?” Fill in these entertaining, thought-provoking prompts to celebrate who you are, where you are in life, and all the things that make you unique. What I Love About You offers couples a fresh way to say “I love you.” The questions and fill-in blanks prompt you to sing your loved one’s praises and say what’s in your heart. Playful and tender, this is the perfect gift for the love of your life. The Book of Us: A Journal of Your Love Story in 150 Questions helps any couple remember and cherish the story of their most important love, from first date to wedding day and through the years beyond, with 150 simple yet thoughtful questions. The Book of Myself: A Do-it-Yourself Autobiography in 201 Questions is a keepsake fill-in journal with 201 memory-evoking prompts to make it easy—and enjoyable—to tell your life story, one page and one memory at a time.